Strip iTunes DRM Legally, 20X Faster Speed, Lossless Quality, Support many video & audio output formats and various devices. • Keep 100% lossless quality after conversion. iTunes Video Recorder is a powerful iTunes M4V DRM removal tool which can legally strip DRM from iTunes purchases and rentals. 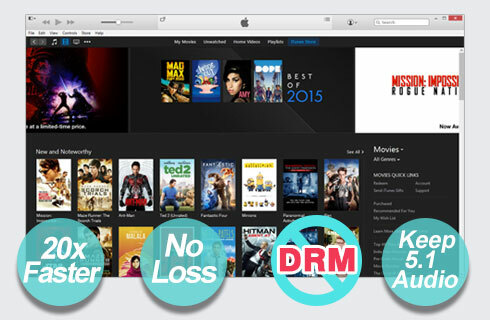 With this iTunes DRM remoal tool, you could get the converted videos without any restriction. It converts iTunes movies or TV shows from protected M4V format to plain MP4, MOV, AVI, FLV, MP3, etc. helping you transfer them to various devices for playback. You can also clip the iTunes movie or customize the output setting for conversion. If you are not familar with the formats, it doesn't matter. There are variouls of predefined output devices for your selection including iPhone, iPad, iPad, iMovie, Android devices, Android tablets, game consoles, etc. You don't need to wait for a long time anymore. With iTunes Video Recorder, you can get a 2-hour iTunes movie converted to MP4 format video in less than 30 minutes. Just enjoy!